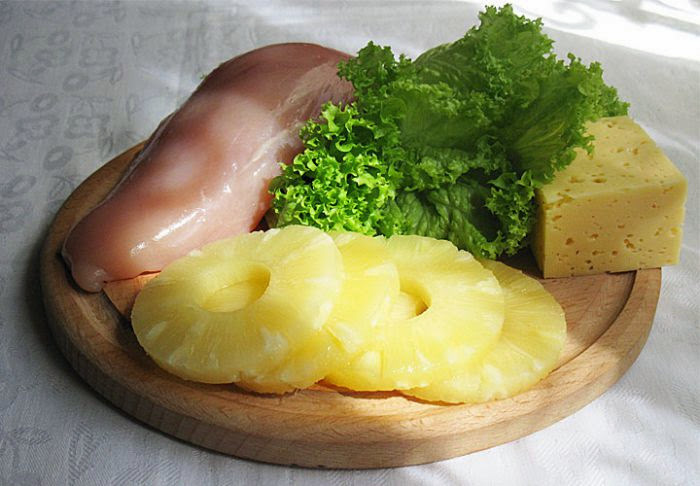 Delicious and easy chicken salad and pineapple. It is light, airy and juicy. 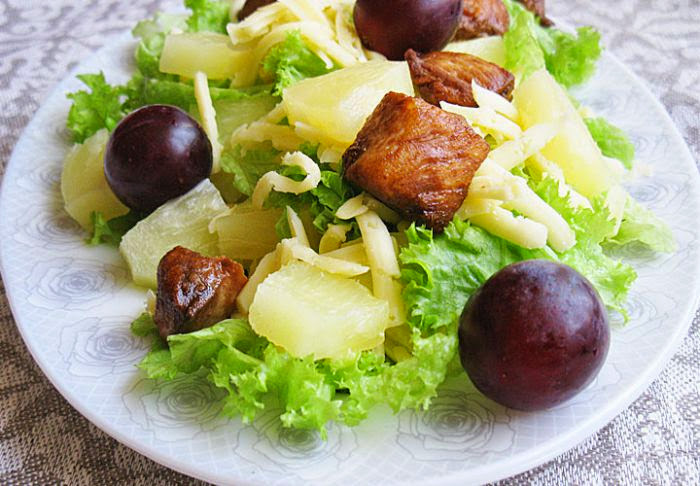 Interesting combination of meat and vegetables will make your gourmet salad. See recipe with photo "Chicken salad with pineapple." Iceberg lettuce - 1 Puig. This salad is a malokomponentnym than once captivates lovers of salads. In addition, this salad like gourmets. Of course, a combination of pineapple and chicken has long been a classic. However, if you have not tried, be sure to prepare yourself at least a little. In the photo you see the basic salad ingredients. All other components can be varied according to taste. 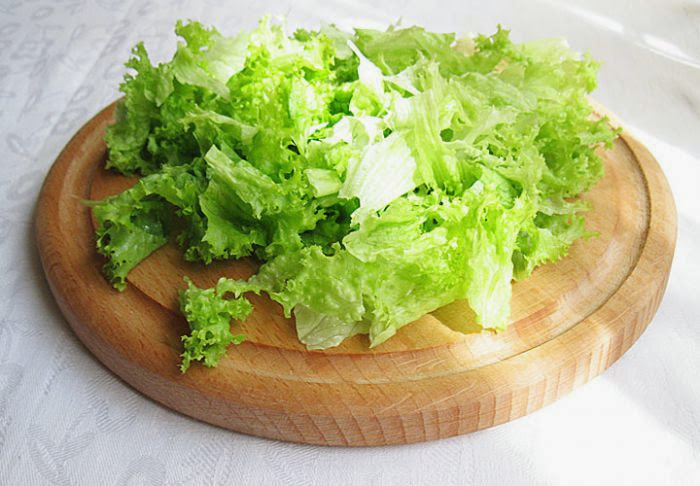 Lettuce should be thoroughly washed under running cold water, shake and break arbitrary slices. 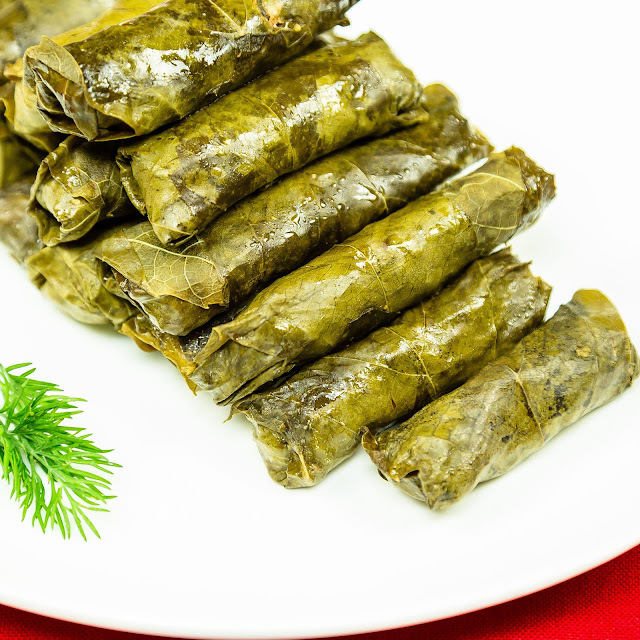 Taste dishes, certainly would have won if we had used several kinds of lettuce. However, in a supermarket stock it was just iceberg, and so they are limited. However, on a nearby shelf lay a large package of mix salad, ready to eat. But I'm skeptical of such goods - who, how and when washed, dried, tearing pieces of leaves ?! Prepare chicken salad. I have long put the chicken to salads, cooked according to the same principle (the basis was taken the Chinese way of rapid thermal processing). So, my chicken, were dried with paper towels, cut into cubes a la carte. 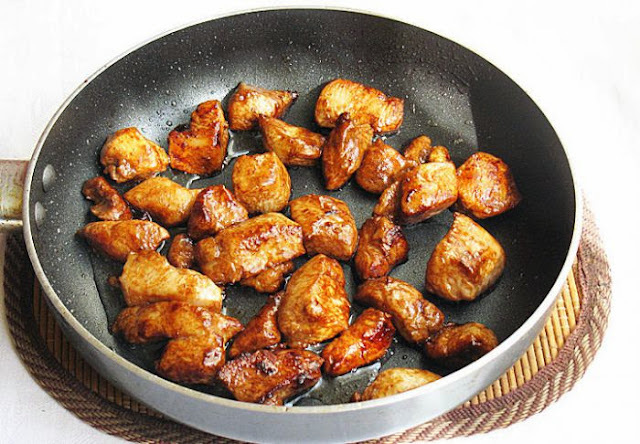 The pan is heated vegetable oil, throw him meat and fry for 3 minutes on high heat. Add the soy sauce, a little (!) Diminish the heat and fry for another 3 minutes. All! Chicken salad is ready! Of course, this trick will not work with home hen. But if you pokupaetet factory chilled chicken, the meat is completely cooked manages !!! At the same time, it turns rosy (thanks to soy sauce) and tender inside (due to the short cooking time). 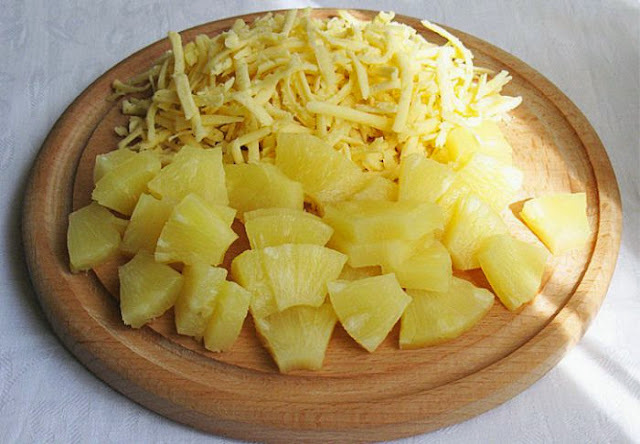 We get pineapples from the banks, they were dried and cut. I prefer cheese to grate rather than cut. I think that will give lightness grated cheese salad. It remains only to mix all the ingredients - lettuce, chicken, pineapple and cheese. I added a bit of grapes, to give elegance and solemnity salad. Note that I did no fill salads. But if you want you can use mayonnaise or other favorite sauce.